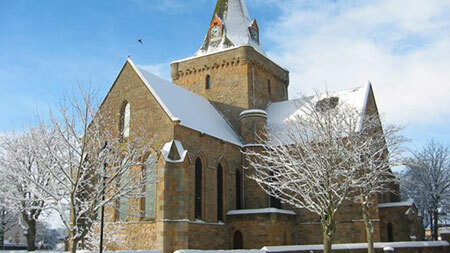 Located in the centre of the town, Dornoch's cathedral dates from the early thirteenth century. It was founded by the Bishop of Caithness, Gilbert de Moravia, in 1224. The first service was held in 1239 but it would be another few years before the construction of the tower and transepts was completed. Visitors to the cathedral cannot help but be impressed by the beauty of the sandstone walls and the vaulted ceilings, but perhaps its most impressive features are the stained glass windows. Outside, visitors can see the town's ancient mercat (market) cross.